Recently I attended a birthday bash (and I mean BASH!) for a very good friend of mine. And somewhere in the midst of all the laughter and small talk and fun, someone asked if I chose to write teen fiction because I have such fond memories of high school. To which I instinctively balked. “God no. It was horrible! I mean, you couldn’t pay me to go back!” This was followed by vehement head shaking and perhaps, even a dramatic shudder or two. Okay, so maybe he’s right. In fact, I guess it’s pretty obvious that he’s definitely right (as usual). And now that it was out there, spoken like a fact, it got me wondering just exactly what I was thinking when I chose to make my living writing about a time in my life which I didn’t particularly enjoy, and at times, actually found quite painful. I mean, since graduation I’d done so many other things, lived in so many other places. So what on earth could be the reason for all this? Am I a masochist? Because now that I find myself smack dab in the middle of the inevitable piling up of years between then and now, I can actually look back on those times and see certain events with far more clarity, and much more objectivity than I ever could’ve mustered up before. And the truth is, simply, that those years shape and inform you in more ways than you think, and that the adult you later become owes a huge debt to the person you were back then. Whether you hated high school (like me) and tend to use that time as a catalyst to get the heck out and carve a more suitable place for yourself somewhere else, or you look back at it fondly, (hard for me to believe but these people do exist) and strive to recreate that feeling wherever you go from there, there’s simply no denying that those years make an impact, and so, they are not easily forgotten. Last April brought about the untimely death of my husband’s twin brother, who battled pancreatic cancer for a year and a half, (and to whom I’ve also dedicated my upcoming novel, “Laguna Cove” as well as to the son and daughter who he so sadly left behind). And while I won’t even attempt to find the words to describe this completely devastating time, I will say that when news of his passing reached a group of their former junior high school friends, they wasted no time in springing into action, and planning a sort of impromptu memorial in Richard’s memory. I remember holding my husband's hand as we made our way up the steep driveway that lead to the house where several of his old friends (all of whom were strangers to me) patiently waited. And where, once inside, we flipped through old photos, skimmed over yearbooks, ate hot pizza, drank red wine, laughed at shared stories and fond memories, and eventually climbed up the hill where we released a stream of balloons, watching as they drifted off into the evening sky, bidding a silent goodbye to Richard. Some of these people drove a long distance, some even boarded an airplane just so they could be there. For us, the trip was a mere hour and forty-five minutes up the trusty 405. And as I sat beside my husband, leaning into his shoulder, while listening to old stories, told by a diverse group of old, junior high school friends, who hadn’t seen each other in over thirty years, it made me think back to my own old circle of friends, and how even though we may not speak all that often, I’m happy to say, that quite a few of them are still in my life. I guess I write teen fiction because it’s the last time you feel so protected yet yearn to be free, you want to fit in but long to find your true self, you hate waking up for school but fear the day when you’ll no longer have to, and you are truly on the verge of so many exciting new “firsts” that you’re in such a hurry to check off, yet you’re also aware that once you do, it’s hard to go back. But I also write teen fiction to honor the memory of the person I was then, as well as the friends who stood beside me, and who were far more important than I may have realized at the time. A few days ago, my husband received a phone call from an old summer camp buddy, that he’d lost touch with more than thirty years ago. Apparently this guy had been reminiscing about his old group of tight knit friends, and has planned a summer reunion so that they can all get together again. By the time my husband hung up, we’d already RSVP'd. P.S. The first chapter of LAGUNA COVE is now available on my website! Visti www.alysonnoel.com for a preview! So I finally made it to myspace and Blog Spot- whew! Thought I'd never finish that profile page. But since Laguna is currently socked in with a major case of June gloom, it's not like I missed a great day at the beach or anything! My third novel, LAGUNA COVE, will be in stores next month. And so I'm pretty much spending all of my time obsessing over that fact, but then also refusing to think about it. Seriously. The encroaching pub date always sends me into a frenzy of excitement and nauseau (okay, mostly excitement, but still), and since I've already finished two other books since I handed in LAGUNA COVE, I'm no longer sure how it goes. Something about the beach. . .and three friends. . .and then there's that new girl. . .and oh yeah, that really hot guy. . .but then she also kind of likes that other guy . 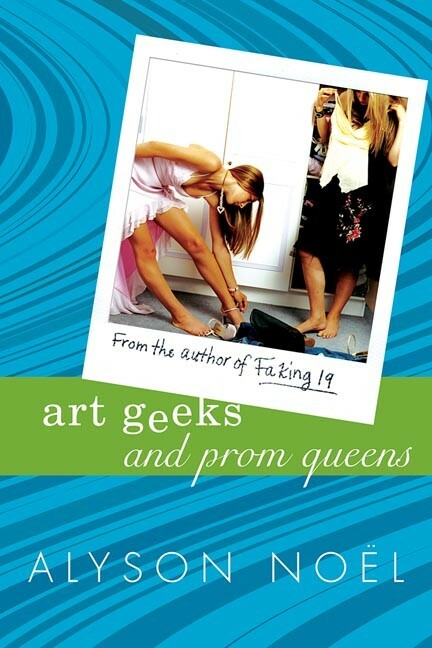 . .
ART GEEKS AND PROM QUEENS continues to bring good news! It recently won the New Yok Public Library's Book of Winter 2006 award, and was also included in their prestigious Books for the Teenage 2006 catalog. Also, it's been nominated for the American Library Associations Teens Top 10 Award- voting takes place in October, and let me just say it's included among so many other great titles, that just being nominated is an honor! Truly! So thanks to all of you who read it, liked it, and told a friend!! But what really left me gobsmacked and speechless and stunned was Niki Burnham's blog last week where she wrote such nice things about ART GEEKS I barely knew how to respond! (And for those of you who know me, you also know how very rare that is!) And if I wasn't so tech challenged you'd be able to click on her name right now and land on her page, but since technology is one of my biggest challenges (really, I'll be amazed if this blog even gets posted) I urge you to look her up, and then go out and get her novel, ROYALLY JACKED. And then when you're done with that go get the sequel, SPIN CONTROL- they are funny, compassionate, and completely endearing- and you'll see why she left me so flattered. FAKING 19 was also nomintated for the New York Public Libary's Book of Summer 2005 award- but John Green's LOOKING FOR ALASKA won. So I went out and bought it, sat down to read it, and could not put it down til I'd reached the end- it was AWESOME.